Fred Donnelson was a native of the state of Iowa, born in a small town called Missouri Valley. It was at a revival meeting conducted by the famous Billy Sunday that, at the age of 12, he gave his heart to the Lord Jesus. After graduating from high school, he served two years in the coast artillery division of the army during World War I. In 1928 he received his bachelor of arts degree from Wheaton College; he also graduated from the Northern Baptist Seminary. Sixteen years as a “missionary to china” unfolded as years of success and sacrifice. Thousands of lives were touched by his ministry during times of peace and war. As a Japanese prisoner of war with his family for nearly two years during World War II, he displayed a characteristic which demonstrated that he never expected of others a price any greater than he himself was willing to pay. 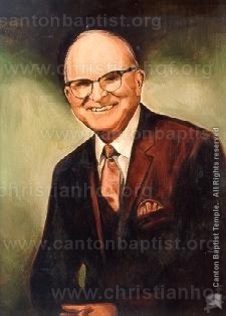 During the eighteen years in which he served as Director of Missions of the Baptist Bible Fellowship and professor of missions in the Baptist Bible College, he became affectionately and respectfully known as “Mr. Missions.” After his death in 1974, his wife, Effie, would use that title for a book that details his life and ministry.